What's this? 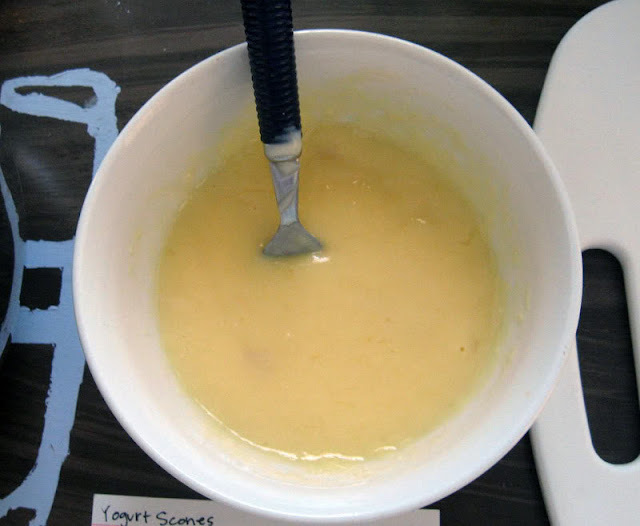 Another recipe that uses yogurt? Yeah, man. That's what happens when you've got peach yogurt coming out of your ears, and you just can't take eating it straight. But I've already discussed this. We don't need to talk about it again. We can, however, talk about these scones. Or maybe The Hunger Games. But it's probably more appropriate to talk about the scones. 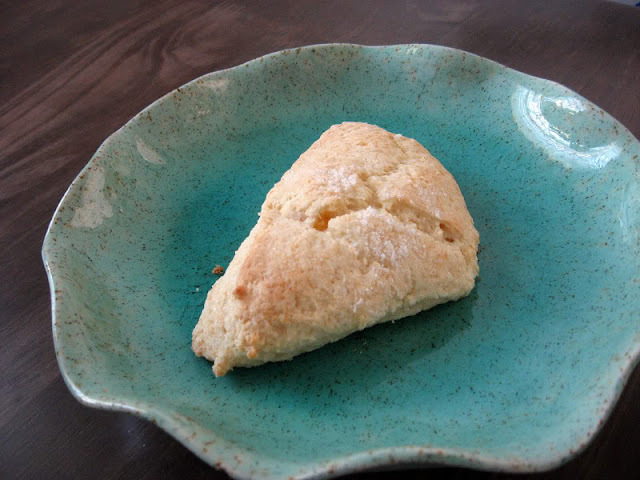 Did you know that this is the first scone recipe I've featured on here? Did you know that it's the first time I've even made scones?! That just sounds crazy, I know. But I somehow thought myself not a scone person. As to why I felt that way, I really cannot answer you, because I just don't know. Sometimes you just go through life having never eaten something for no good reason. Not that I'd never had a scone. Because I must have had one at some point, right? It's just I can't really remember it. Hmm. Oh well! Despite my scone unfamiliarity, I have to say I really liked how these turned out. Yummy scrumdiddlyumptious. That's totally a word. Combine Bisquick and sugar. Stir beaten egg, yogurt and butter together in a separate bowl. Add that mixture to the Bisquick until it all just clings together. 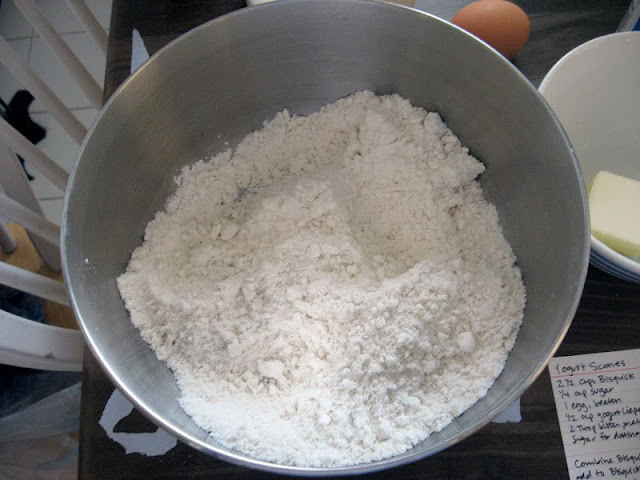 Knead gently on a floured surface approximately 8-10 strokes. Form a 6 inch circle with the dough and cut into 10 wedges. Sprinkle with sugar and place on an ungreased baking sheet. Bisquick and sugar mix together. 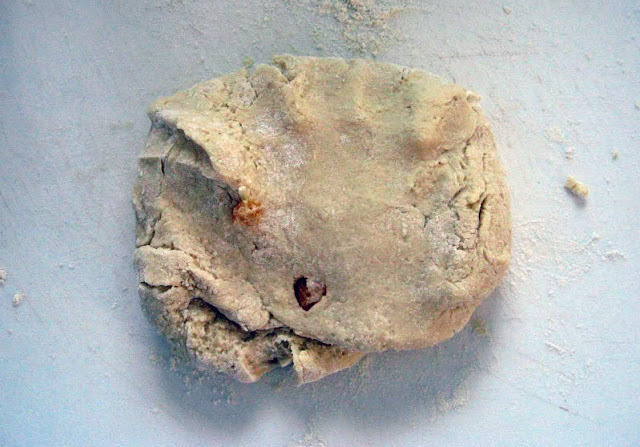 If you don't have Bisquick, you can instead cut together 2 1/2 cups flour, 3 3/4 tsp baking powder, 5/8 tsp salt, and 2 1/2 Tbsp shortening. Egg, butter and yogurt all mixed. Add the wet stuff to the dry stuff and it should look something like this. 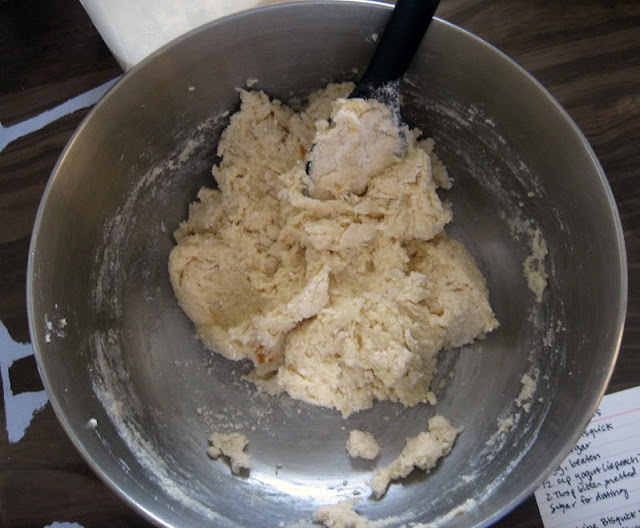 Knead it some on a floured surface until it all holds together well. 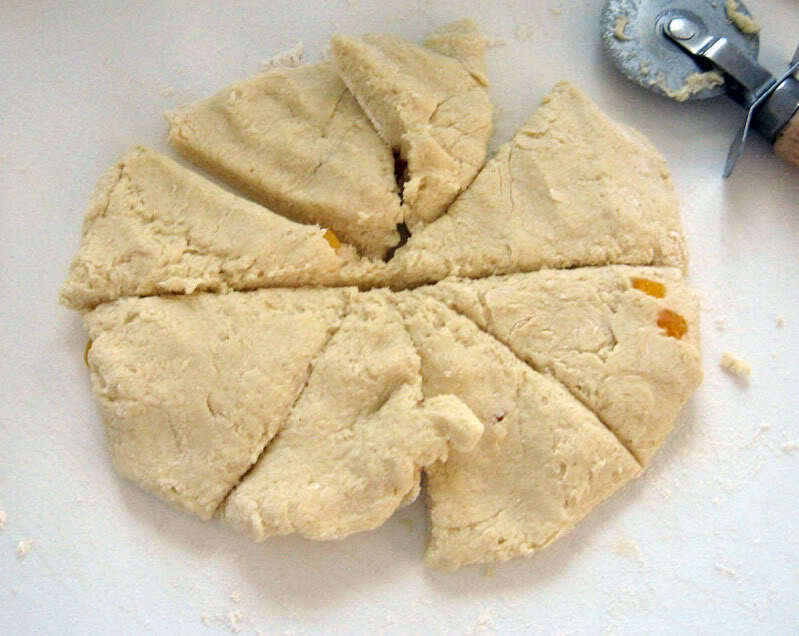 Push it out into an approximately 6 inch circle and cut it up. 10 wedges is recommended, but I only did 8 since I used the pizza cutter and it was easier. Sprinkle with sugar and arrange them on your ungreased sheet. Bake for 10-12 minutes until golden. 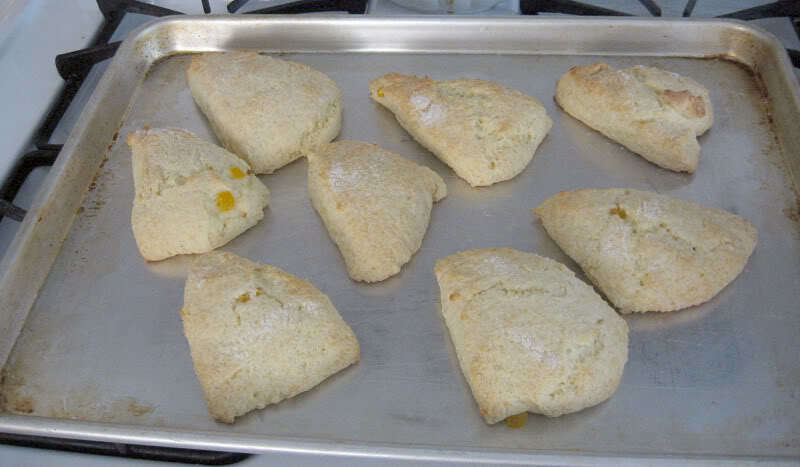 Enjoy delicious scones! 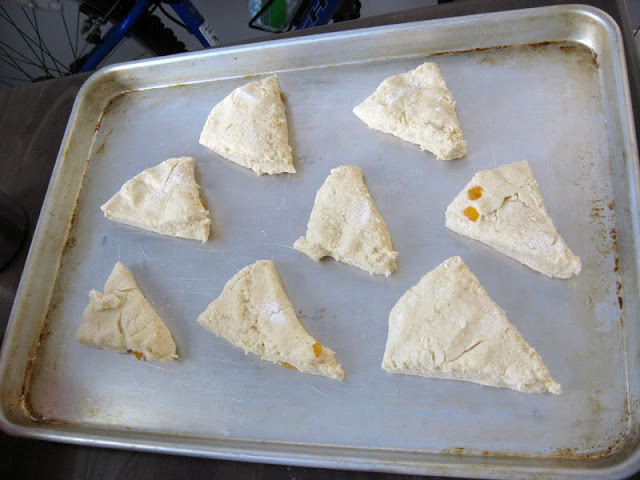 This recipe was very easy to do, and the scones aren't bad at all. Although, to me, they taste more like dough than like the peach yogurt I used. I will probably make them again but will add more than 1/4 cup of sugar. (But that's just me!) All in all though, the recipe was very simple, worked well, and was good! I'm just going to tune it a little bit to suit my personal taste! Thank you for sharing!!! Personally I am not a huge fan of peach yogurt, so that's why these appealed to me, because they masked that taste, with more of just a hint of it than the actual taste of it. I'm sure adding in some real peaches might also help amp up the peach factor as well, in addition to any sugar you may want!